What would you say if someone told you the rest of your meals for your entire life were covered? Great, right? But could you buy a “lifetime” of food for $10,000? Maybe at Taco Bell, as the chain’s new “Eleven Everlasting Dollars” contest claims each winner will win free Taco Bell food for life. Oh yes, there is an asterisk, because while surely going south of the border can be cheap, a lifetime is a long time. So as Taco Bell explains, it’s free food for life if you’re going to eat about $10,000 worth of burritos and chalupas before you shuffle off this mortal coil in approximately half a century. And you pay taxes on your own. *Prize awarded as $10,000 in Taco Bell® gift cards. Based on average consumption ($216 per year) for 46 years. Dollar Cravings Menu™ at participating locations. Prices and Items may vary. Prices exclude tax. So could you survive on $216 worth of Taco Bell food every year? Probably not, if you eat only $4 worth of food in a week. 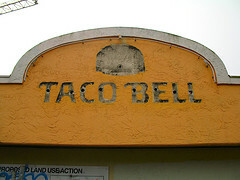 But can you spend $10,000 at Taco Bell in 46 years? That’s between you and your stomach, friend. You two set the terms of what you want to do to each other.